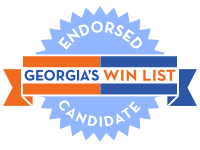 Georgia’s WIN List is proud to endorse former House Democratic Leader Stacey Abrams, the Democratic gubernatorial nominee. Abrams leads a slate of the most diverse candidates the Georgia Democratic party has ever fielded. Leader Abrams, a businesswoman, attorney, and best selling author, grew up with five siblings in Gulfport, Mississippi. Despite their own financial struggles, her parents made serving others a way of life and instilled in her the values of faith, family, service, and responsibility. With an undergraduate degree from Spelman and a law degree from Yale, Stacey Abrams was first elected to the Georgia House in 2006. By 2010, she rose to become the first woman to lead either party in the Georgia General Assembly and the first African American to lead in the House of Representatives. During her legislative tenure, she worked to stop legislation which would raise taxes on the poor and middle class or roll back reproductive healthcare. She has brokered compromises leading to progress on transportation, infrastructure, and education. Most recently, she passed legislation to improve the welfare of grandparents and other relatives raising children and secured increased funding to support these families. Her bold agenda for Georgia includes investment in education from “cradle to career” which prepares children for a lifetime of opportunity, mobility, and success. She pledges economic development efforts to move Georgia from poverty to prosperity, with a goal of “no one having to work more than one full-time job to make ends meet.” She proposes Medicaid expansion as the only path to provide health coverage for the working poor and also prevent the closing of rural hospitals and the resulting economic collapse of surrounding communities. Read more about Stacey Abrams, her campaign, and her proposals on a broad range of issues at her website. The nomination of women for both Governor and Lt Governor in 2018 fulfills the dream of Georgia’s WIN List founders who first began meeting almost two decades ago. We are fully committed to electing the 36 endorsed women who are running for seats long held by Republicans in November and we must more than double our budget to do so.